Now that I've stopped ignoring TCHO for inexplicable reasons, it's time to approach a bar I've been seeing at the store for a while. This would be their Mint Chip Gelato. You'll note that the cocoa content of this chocolate is 64%, somewhat higher than the past couple of bars I've reviewed though still around the middle range. It makes sense in this case to stick to a low cocoa content because of the sweet and casual, dessert style of gelato and ice cream; I am glad, though, that the content isn't so low as the 50's. Now, as I was picking up the bar to photograph, I couldn't resist glancing back at the ingredients list, and what did I there find? Freeze dried gelato. 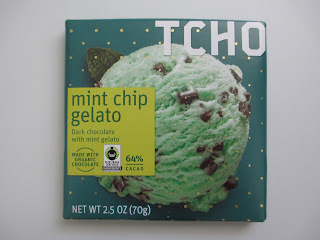 That's right, the name Mint Chip Gelato is quite literal, and that's possibly very weird; I had expected there would be some sort of creaminess to this chocolate that would mimic gelato, not actually gelato inside. I mean, the wrapper does feature a big scoop of gelato, so maybe I should have taken them literally. It's a fun wrapper that, what with the ice cream and deep blue-green and gold dots and multiple labels, still manages to look clean and simple. I like how the labelling is all honest on the front, saying that it's "made with organic chocolate." This is because, of course, while the chocolate is organic and fair trade and the sugar and vanilla beans in the chocolate are organic, none of the ingredients in the freeze dried gelato are organic or anything. (In case you were wondering, the gelato contains milk, sugar, carob four, and mint oil, which sounds slightly random to me.) I'm being silly in calling this "their honesty" but I'm also serious: it's good for a company to admit straightaway what type of ingredients they're using. As far as the whole freeze drying thing, I don't think it was worth it. Those chips of gelato have that air bubble light crunch that you'd expect from something that's freeze dried. This means that they give no creaminess to the texture: the chocolate is creamier. As far as flavor, there are a lot of these pieces of gelato but not enough in order to give the taste of cream and milk. So it's gelato chocolate with neither the texture nor the flavor of creamy gelato. Sure, if you let the chocolate melt more rather than chewing it more, you will get more of an ice cream feel. 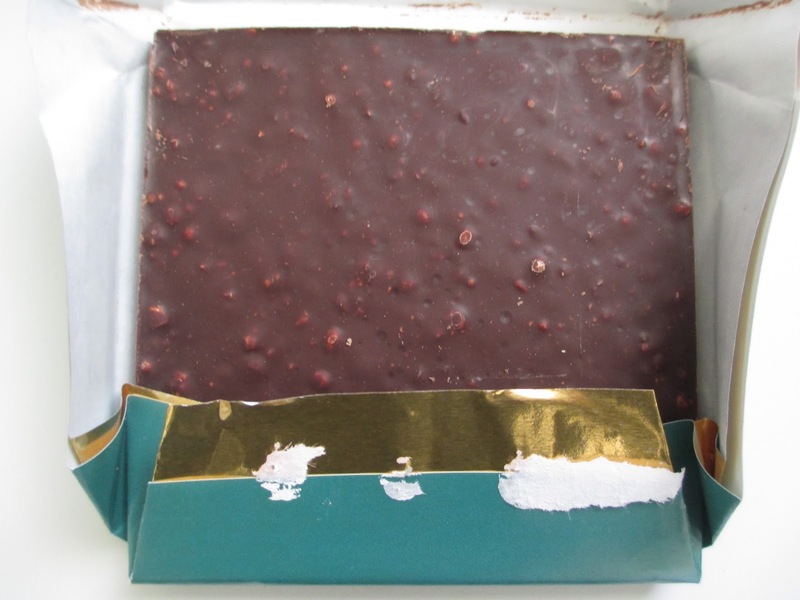 But generally with flavored chocolate and especially with chocolate with pieces of crunchiness in it, people tend to chew the chocolate more than let it melt. So that probably doesn't help much, anyway. The 64% chocolate is fine. It serves its purpose well. This isn't a particularly sweet bar of chocolate (that is, it is of the sweeter sort, but not like candy sweet or milk chocolate sweet), neither does it introduce darkness or bitterness of any kind. The chocolate adds more of a stable, general chocolate flavor. Whenever mint is involved, after all, all of the other flavors tend to take the backseat. So I don't entirely know what to say in conclusion. This chocolate bar tastes good. It just isn't what I expected. When you put a big scoop of ice cream on the front, I want more of an ice cream effect. Even the more candy-like offerings of ice cream chocolates from Klondike and Godiva gave that, though of course they did it through a creamy filling. And a creamy filling is, in any case, something you can do in a bar, just ask Ritter Sport. Basically, that was the type of effect I thought I was going to get after seeing that big scoop of ice cream. So I guess what I'm asking for is slightly different package marketing--or just forget the whole freeze-dried gelato thing in favor of another, more effective approach. You don't always literally use that whose effect you're trying to replicate. I mean, I'm enjoying this bar. It makes for a great dessert chocolate, it really does, since it has both that sense of sweetness and the mild dark chocolate. So I'm not sorry I tried it and I can recommend it; just know that it won't have the creamy gelato effect.